Just as genealogies link families, academic genealogies form family trees of scientists or scholars, each descending from their dissertation supervisor. These trees represent lifetimes of achievements and advances, a progression in our knowledge about the world. 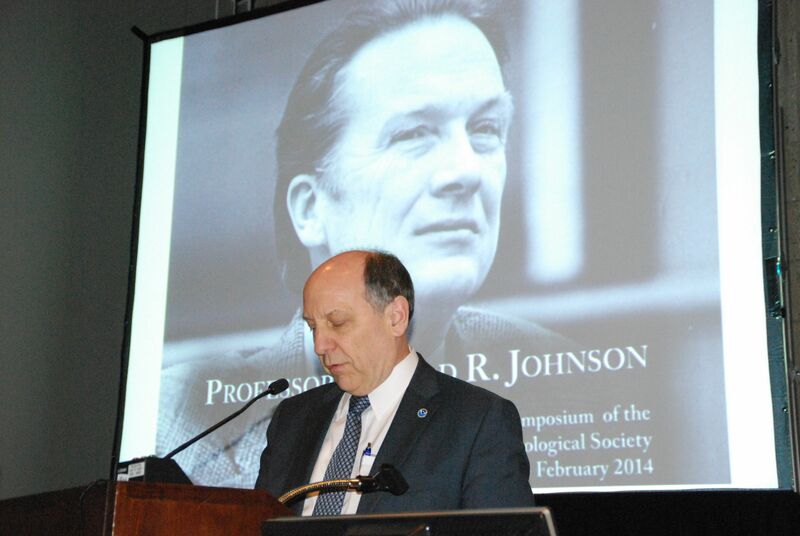 Donald R. Johnson, February 6, 2014. Credit: Bill Kuo. Professor Emeritus Donald R. Johnson, University of Wisconsin-Madison Department of Atmospheric and Oceanic Sciences and the Space Science and Engineering Center, was honored by his extensive family tree of students and colleagues on February 6, 2014 at a special symposium in Atlanta during the Annual Meeting of the American Meteorological Society (AMS). Johnson’s own academic ancestry boasts such names as Lyle Horn (UW-Madison, 1960), Reid Bryson (University of Chicago, 1948), Carl-Gustaf Rossby (University of Stockholm, 1925), and Vilhelm Bjerknes (Karlsruhe Institute of Technology, 1890). National Weather Service Director Louis Uccellini, one of Johnson’s PhD students and colleagues, opened the Symposium with an address summarizing Johnson’s “lifelong effort in the research and education related to the study of the Earth’s wondrous atmospheric circulation regimes,” including our ability to predict weather. 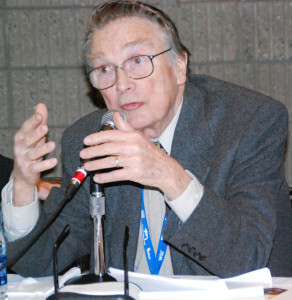 He commented that many of today’s advances have direct or indirect connections to Johnson’s body of work. Louis Uccellini speaking at the Donald R. Johnson Symposium, February 6, 2014. Credit: Bill Kuo. Words of wisdom. You have to define what you think is important and hold fast to what you think life is about. Your children (and students) have to be high in the list. You have to be demanding of them, let them know that certain things are expected, show them how it’s done and then let them do it. Among the many symposium presenters were former Johnson students Robert Gall, Richard Anthes, Todd Schaack, Bette Otto-Bliesner, Martin Hoerling, and John Zillman and colleagues William L. Smith, John Dutton and Martin Ruzek.